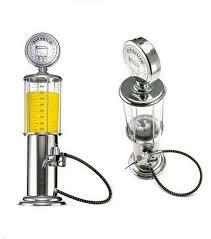 Silver Finish Liquor Pump! No Home Should Be With Out This! This Single Beer Machine (mini Gas Station with Pump Shotgun) Beverage Dispenser is a perfect addition to your holiday parties. Fill with punches, soft drinks or eggnog and just pump! Imprinted in Center of Base "HIGH OCTANE" and "CONTAINS ALCOHOL". Sure to bring LIFE to the party. Guaranteed to make you smile! Tell your guests to leave the ladle at the door. When it’s time to top off their tipple, the Chrome Gas Pump Drink Dispenser delivers some old-fashioned deliciousness with thoroughly modern convenience!